I watched the season 5 premier of Breaking Bad and after watching it, I have concluded that the show has seen better days. I loved the first couple seasons. Season 3 was pretty good too. I didn't like season 4 as much. Don't get me wrong, I still like the show, I'm just saying it's probably a good thing this is the last season. I get the impression that they didn't expect the show to last this long and maybe that's why it is starting to trail off towards the end. The Episode starts off with Walt at a diner with a full head of hair and a beard. He meets a guy undercover and gets a car with a large gun in the trunk. They didn't really explain much, but we can conclude after watching the rest of the episode that this is a scene from the future that will happen later in the season. So back to the present time, Walt is relaxing at home when he remembers there is video footage of them from the lab. This drove the episode plot. I like how they had to go destroy the evidence from the laptop, but I don't really like how they went about it. First off, Mike comes back and is pissed that Walt killed Gus. Really, I think he is overreacting. Why does he even care that much? Mike should be retired by now anyway. Next Jesse is back working with Walt. If I'm not mistaken, I thought they were on bad terms last time we left off. Oh well, we'll go with it. So they get the electromagnet from the junk yard. Already they are tipping these guys off that they are using it to destroy evidence at the police station. The junk yard guys are now witnesses. Sloppy work guys. Then they are going to use it to try to destroy the laptop on the other side of the wall. I know they don't have many options, but this is going to destroy a lot of other evidence at the same time. That is not ethical, but I suppose at this point they don't care. Next we find Ted is basically on life support in the hospital. I didn't even recocognize him and actually had to Google him to remember what actually happened to him. Apparently it was when he tripped and hit his head. So now he is in the hospital and looks like he's almost dead? I don't think so. 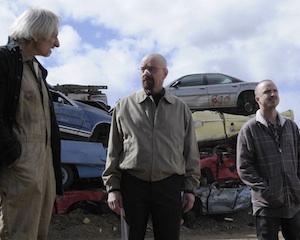 Overall they are trying to make Walt out to be like the new bad guy to replace Gus. I don't like this direction the show is taking. Walt is a good guy and the only reason he started all this was to help his family. He needs to secure the money and get out of this mess he has created. If it were up to me, I would have it go like this: Hank discovers Walt is involved and finds out everything that has been going on. He decides to cover for for him so he doesn't go to jail. Then Walt and his family live happily ever after. Then at the end, maybe he goes back to do a guest speak or a substitute teach at his old school. The kids start acting up and give him a hard time or whatever. Old Walt might have just taken it and felt defeated, but now new Walt does not put up with that, and puts them in their place. How awesome would that be? So yeah overall I don't really like the direction the show is going, which is a shame considering their ratings are higher than ever. None the less, I will continue to watch the rest of the series. If you have any comments on the show or this season, feel free to leave a comment below.